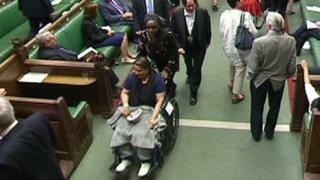 There have been calls for a reform of "archaic" Commons rules after a sick Labour MP had to enter the lobbies in a wheelchair to cast her vote. Naz Shah said she felt she had been stripped of her dignity after being told she would have to vote in person during Wednesday's Brexit bill debate. Labour has accused the Tories of suspending a convention sparing unwell MPs from having to enter the chamber. But the government blamed Labour for her ordeal. Commons leader Andrea Leadsom said she was "particularly sorry" that Ms Shah, the MP for Bradford West, had been "forced to come and vote". "But the fact that she had to come all the way from Bradford when she was clearly so unwell is clearly a matter for the honourable lady's party." She said the government had only been told of Ms Shah's situation just after midday on Wednesday. The government won the vote on the EU Withdrawal Bill by 319 to 303. Traditionally, unwell MPs are able to be "nodded through" by whips if they make it onto the Parliamentary estate, without having to leave their vehicle and enter the House of Commons, and it is rare for this convention to be cast aside. Labour's shadow Commons leader Valerie Vaz said she had heard Tory whips confirming it would not apply in Wednesday's vote. "All the trust and conventions appear to have broken down that enable us to carry out our work here," she said. Ms Shah's office said she had been in hospital in Bradford since last Friday with "excruciating" nerve pain resulting from a hit-and-run collision and went "absolutely against doctor's advice" and had to sign a form to be allowed to leave. She is now back in the city's royal infirmary after a round trip of over eight hours. She told The Guardian she had been told by her party's whips to travel to Westminster but assured she would be able to stay in the car - however she said the Conservatives insisted she had to vote in person by walking through the voting lobbies in the Commons. She added: "I was in my pyjamas. It felt personally very undignified and very invasive. It was embarrassing. I thought I'd just be able to stay in the back of the car, where I'd made a bed for myself, and be counted there, but the Tories wouldn't have it. "By making me go in to vote like that, they stripped me of my dignity." Meanwhile the Lib Dems' deputy leader voted while nine months pregnant. "This is no way to run a Parliament in a modern democracy," Jo Swinson tweeted afterwards. "Deciding matters of state, or which parts of the country will have their voices heard, should not be determined by which MPs can be discharged from hospital or happen to be in childbirth. We need proxy voting." MPs are currently considering whether members who are new parents should be able to vote by proxy. A debate on the issue is to be held on 5 July.